Say what you like about Ipswich -- and people do -- but while there's no cathedral and no city, there's always been diversity. Take this week's destination, number 4 St Helens Street. Forty years ago it was the Venetian Blind Centre. You know, Italy's sinking city. Go back fifty years and this was a grocer run by one T.Pozyczka. Polski sklep? It was still a grocer sixty years back, at that time owned by Mrs J.Michalska. I dunno, these people, coming over here, running our shops. 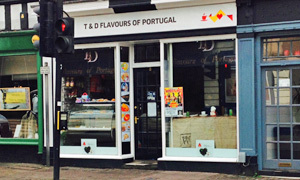 Currently 4SHS is home to evidently foreign Flavours Of Portugal. Unlike its ever-expanding Iberian cousin O Portugues on the other side of town, FOP's a minnow, yet manages to cram in seats for perhaps ten sardines. Half of those are occupied when we get there, always a good omen. Once more, there's no obvious menu so we rely on the nice lady to talk us through the ready-made sandwich stroke panini savouries, apparently filled with cheese/ham/chorizo. Once heated, they're filling, certainly, and the bread has traces of sweetness. An acquired taste, perhaps, and helped by (a) um saco grande of ketchup flavour Ruffles crisps, yum, and (b) cans of refreshing Guarana and Sumol, recalling the bizarre boutique that was the Brasilia Cafe. Window seat here offers a terrifc place to watch the world go by, especially when there's a matinee performance of The Full Monty about to start. Coachloads of folk are trooping into the Regent as we go in search of sugar. A friendly chap runs us through the fabulous array of cakes in the window. Most, he says, include custard. We point and pick two yellow giants, a large tart and a terrific cinnamon cake, both with their share of that sweet confectioner's sauce. They're a real treat, esp. with a strong cup of coffee from the fancy machine. Not to mention the free WiFi, the Star to flick through, local leaflets, and a wide variety of grocery goods in the great tradition of this store's long history. If it was a car -- UMM Alter 2000. If they were passing by -- Ricardo Rocha.